Our freedoms, our rights, our societies depend from people who take a stand in their defence. In other words human rights need defenders. Human rights defenders take personal risks. In many parts of the world they are harassed, jailed, prosecuted, attacked and killed in impunity. Protection international stands for the right to defend human rights, by protecting defenders we are protecting your rights too. We aspire to a world in which fundamental human rights and fundamental freedoms are universally recognized and respected by all, and where everyone has the right to defend these rights and freedoms without fear of threats or attack. Our contribution to that world is to support human rights defenders through comprehensive protection programmes. 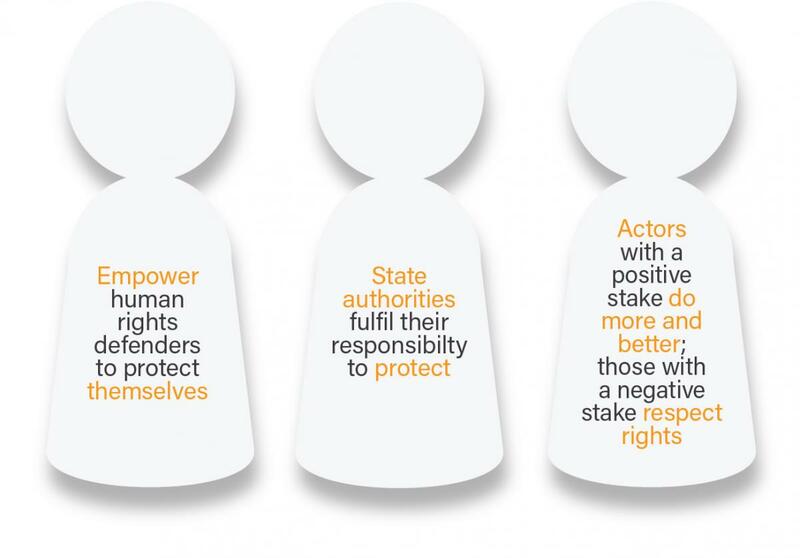 Our programmes empower defenders build their capacities in order to manage their protection effectively, to allow those that protect them fulfil their obligations, and to convince other individuals and institutions with a stake in the protection of human rights defenders to maximise their positive contribution. Protection International always works in partnership with defenders. At Protection International, we do not focus on one group of defenders or one issue. And we are not interested in short-term fixes. Instead, building upon a foundation of research, partnership and field work, we find durable solutions to protection issues and build the capacity of defenders to manage their own protection effectively and holistically. We work in partnerships with communities, grassroots civil society organisations and human rights activists worldwide to bring protection strategies for human rights defenders at risk, from remote villages to policy-makers’ offices, to intergovernmental organisations - so that defenders can do their work and build more prosperous and free societies. Empowering HRDs to manage their protection themselves in an integrated and sustained manner. Encouraging authorities to comply with their legal duty to respect, protect and fulfil human rights. Making other individuals and institutions with a positive stake in the protection of human rights defenders to do more or better, and those with a negative stake to respect the rights of defenders.